I couldn’t decide which to post..the lentil soup or lentil salad. The weather here in France finally decided for me. The trees are in bud, the tulips are in bloom, the daffodils are nodding their heads and the strawberries are sweet. But we still take to the streets with our coats and scarves en walk head first into the wind. I’m not complaining…like my wine maker neighbor says; “C’est normal”. It gives me a little longer to enjoy a bowl of soup, easy and quick and filling. Remove the seeds from the peppers, cut into strips and place in an oven pan, drizzle with olive oil. Roast at 200 degrees C for 30 minutes or until tender. Sauté the chopped onion in some oilive oil until tranlucent, add the vegetable stock, lentils and the two bayleaves and simmer for about 15 minutes, until the lentils are tender. Add the peppers and simmer for another 5 minutes. Let it cool down, remove the bay leaves and puree with a handmixer until smooth and creamy. You can also press it through a fine sieve if you want it smoother. Taste for salt and pepper, add some red wine vingear for a little tartness and I add a tablespoon of red pesto for flavour. Serve with shaved parmesan and decorate with some parsley or coriandre leaves. Optional: Stir in some cream for a richer version. Alternative: The peppers can be halved, then roasted with the skin side up and the skin can be easily peeled off after roasting. You can try and add more, or larger red peppers and lessen the red lentils. You can add up to 4 or 5 large red peppers. Add a little bit more stock if it gets too thick. Don’t overcook the lentils, cook them until just tender. Instead of the red pesto, which is usually a sundried tomato paste, use only a heaped TBSP concentrated tomato paste or even more, to add color to the soup. Add some chopped ripe red tomatoes or a small can of chopped tomatoes to make it more liquid. 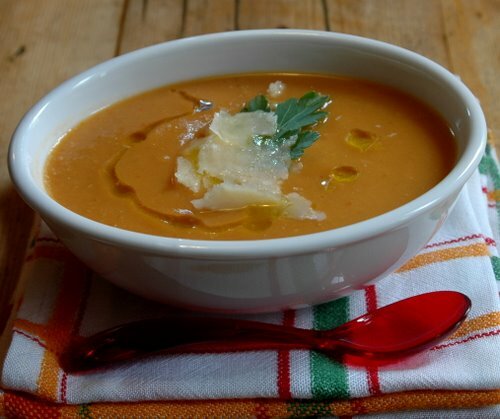 If you don’t like thick soups, try the following recipe where nothing is blended: Red lentil, carrot and pancetta soup… just add the red pepper and leave out the carrot or play around with the recipe. This is an entry for WTSIM, hosted by Jeanne at cooksister. This sounds delicious—and the Parmesan and herb garnishes are nice visual touches! Here in Chicago, we’re having the same weather, with spring being coy about finally getting here. So I’m taking advantage of it as you are, making hearty, warming soups like my lentil soup with kale and sausage. Your soup looks fabulous, great colour. Bet it’s really tasty. A really nice combination both for taste and in visual. I’m so jealous that the daffodils are coming up…soon….soon. It’s been years since I’ve made lentil soup because my husband doesn’t like it, but this sounds too good to pass up. The addition of red peppers sounds particularly good. Oh, that looks so tasty! And, as always, your photo is beautiful. So glad you’re back! I think I am getting addicted to soups! This sounds like a great one. Your photos are beautiful too. Sounds perfect! I love the garnish and the drizzle of oil. Oooh, looks delicious! I love red lentil soup and the addition of the roasted red pepper would be something special indeed. Great photo too 🙂 THanks for contributing to this month’s WTSIM! This looks great. Pulses and roasted red peppers make such a tasty combination! love red pepper soups! It looks so delicious, and also the water bowl is wonderful. I found some lovely terracotta ones in India, but they don’t travel so well, so could not bring them back. Sorry to comment again on this post (I make it a rule to almost never comment on non-vege dishes). But a little present awaits you in my latest <a href=”http://vegeyum.wordpress.com/2008/05/03/an-award/” post. HI, I have just made this soup and can honestly say, it looked nothin like your picture. I followed your receipe completely and it has just turned out like baby mush. I added more stock, but nowe it just tastes like greay veg soup. Hi Jo, I’m sorry that the soup is not to your liking. It is in fact a thick soup. *You can try and add more, or larger red peppers and lessen the red lentils. *Don’t overcook the lentils, cook them until just tender. *Instead of the red pesto, which is usually a sundried tomato paste, use a heaped TBSP concentrated tomato paste or even more, to add color to the soup. *Add some ripe tomatoes or a small can of chopped tomatoes to make it more liquid. See the suggestions in the recipe for another lentil soup version if this one isn’t satisfactory.